Chris Ann Goddard, founding partner of public relations firm CGPR, will share PR best practices at this month’s Outdoor Retailer Snow Show (ORSS) in Denver, the largest U.S.-based outdoor industry trade show. ORSS attracts more than 1,000 exhibitors and 29,000 attendees hailing from 60 countries across the globe. The panel, “Outdoor Amplified,”will highlight optimal public relations practices for sharing and shaping narratives that successfully resonate with both target audiences and the media, and will take place on Thursday, January 31, 2019 at 9:00 a.m. at THE CAMP located on the upper level. With deep knowledge and long history serving clients in the outdoor category, Goddard has developed and engineered communications programming for leading apparel, fashion, footwear, gear and component brands including adidas Outdoor, Canada Goose, Kelty, Merrell, Moncler, Mountain Khakis, Patagonia and PrimaLoft, among others. CGPR also worked in partnership with Outdoor Retailer to manage the move of the trade show from Salt Lake City to Denver. 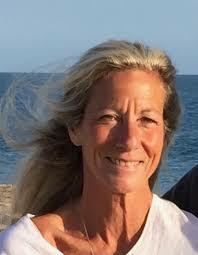 Goddard’s career began in politics, lobbying in Washington, D.C. for environmental issues, conservation and urban recreation, serving the Mayor of New York and in the White House.Her professional foundation was further solidified by a personal passion for sail boat racing and road cycling, and the obvious need for proper gear and equipment. Goddard will be joined by Julie Atherton, principal of JAM Collective in San Francisco; Drew Simmons, president and founder of Vermont-based Pale Morning Media; and Ethan Peck, head of PR for United by Blue based in Philadelphia. The panel, moderated by Jeanine Pesce of RANGE, will also be live-streamed via RANGE’s Facebook page. CGPR is a dynamic, versatile and accomplished consumer active lifestyle agency founded on the premise that passion breeds enthusiasm, a structural tenet that has ensured the agency’s 25+ years of success. The firm’s accumulated experience is a result of collaborations with iconic lifestyle, fashion, footwear and apparel brands, component manufacturers, and outdoor industry trade organizations and events. CGPR maintains bi-coastal presence and offices in both Newport Beach, Calif. and north of Boston in Massachusetts. For more about CGPR, visit www.cgprpublicrelations.comor follow CGPR on Twitter or Instagram @CGPRMarblehead. 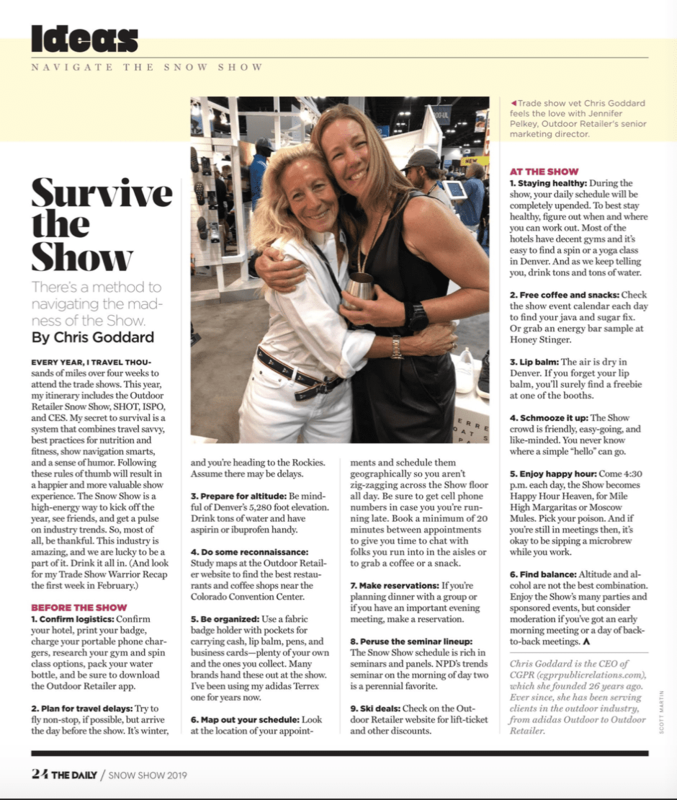 Chris Ann Goddard of CGPR delivers tips in the OR Daily on how to survive the Outdoor Retailer Show, an event she has attended more than 40 times.